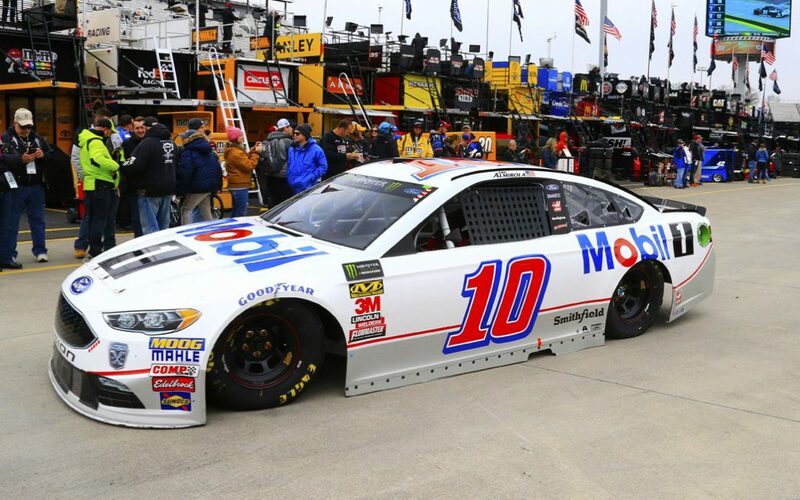 ● Aric Almirola started Stage 1 in the 10th position at the paperclip-shaped track and ended it in the 19th spot. ● The Mobil 1 driver was the fastest car on track by lap 30. ● Almirola’s car made contact with the No. 4 of Kevin Harvick on pit road following the lap-52 stop, causing slight damage to the right front of the No. 10. ● Johnny Klausmeier, the Mobil 1 crew chief, called Almirola back down pit road following the contact to repair the right front. ● Almirola was able to race back into the top-20 by lap 100. ● The Tampa, Florida, native requested “more drive off” as the first stage came to a close, though he was running top-10 lap times. ● The 33-year-old Almirola began Stage 2 from the 19th spot and ended the stage 13th. ● Before the start of Stage 2, the Mobil 1 crew serviced Almirola’s Ford with four tires, fuel and adjustments. ● Almirola raced his Mobil 1 Ford Fusion back into the top-15 by lap 224. ● On lap 255 Almirola raced around the reigning NASCAR champion, Martin Truex Jr., to take over the 13th spot. ● Almirola entered the final stage in the 14th position and completed it in 14th. ● The Mobil 1 team battled a loose-handling condition through most of the stage. ● Almirola persevered and raced back into the top-10 by lap 329 to put all four Stewart-Haas Racing (SHR) cars into the top-10 once again. ● The Mobil 1 driver had raced into ninth prior to the lap-384 caution, where he opted for a full-service stop with chassis adjustments. ● Unfortunately, Almirola was penalized for speeding in Zones 5 and 6 on pit road during the lap-384 caution and had to restart in 14th. ● Almirola once again worked his way into the top-15 and ultimately finished 14th – his sixth top-15 finish in six races. ● NASCAR postponed Sunday’s Cup Series race at Martinsville to Monday due to snow. ● The last time snow postponed a NASCAR Cup Series race was in 1993 at Atlanta Motor Speedway. ● Monday marked Almirola’s 250th Cup Series start. ● Almirola has yet to finish outside of the top-15 this year. ● There were four caution periods for a total of 33 laps. ● Fourteen of the 38 drivers in the Martinsville 500 finished on the lead lap. ● Bowyer won the Martinsville 500 to score his ninth career Cup Series victory, his first with SHR and his first at Martinsville. His margin of victory over second-place Kyle Busch was 1.146 seconds. ● Bowyer’s victory in the Martinsville 500 marked the 47th overall win for SHR. It was the organization’s 43rd points-paying Monster Energy NASCAR Cup Series win and its fourth at Martinsville. ● This was SHR’s seventh Cup Series victory with Ford. The team won its first race with Ford when Kurt Busch captured the 2017 Daytona 500.